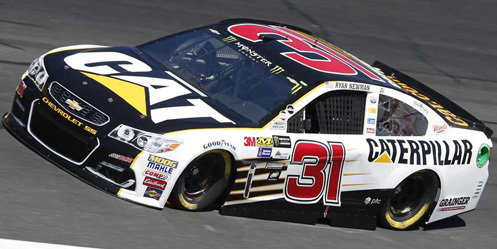 Ryan Newman picked up the 10th last-place finish of his Monster Energy NASCAR Cup Series career in Sunday’s Bank of America 500 at the Charlotte Motor Speedway when his #31 Caterpillar Chevrolet was involved in a multi-car accident after 43 of 337 laps. The finish, which came in Newman’s 578th series start, was his second of the season and first since Kansas, 19 races ago. 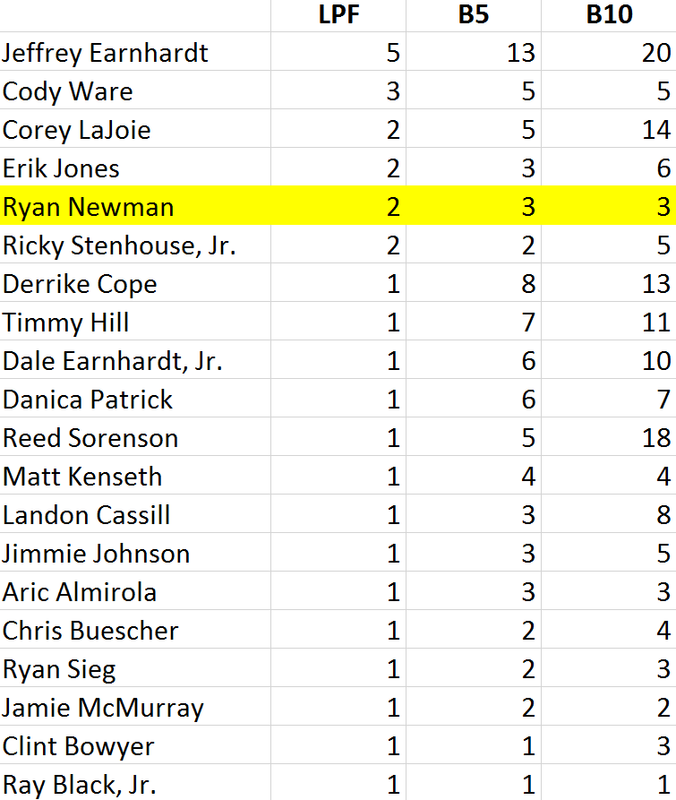 Following the last-place run at Kansas, Newman earned a number of strong runs without a single DNF. He finished no worse than 15th in the next six races, including a 4th at Dover and a 5th at Daytona in July. He survived the crash-plagued Brickyard 400 to come home 3rd, then entered the Playoffs with a streak of four consecutive finishes of 7th or better, capped by another 3rd-place finish in the cutoff round at Richmond. The Phoenix win lifted Newman further from 16th to 11th in the standings, but a 23rd-place run in the Chicagoland opener dropped him to last in the Playoffs. 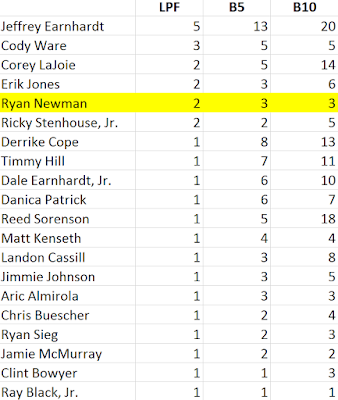 Over the next two races, Newman fought his way to within two points of Ricky Stenhouse, Jr. for the final transfer spot, trying to stay on the lead lap ahead of leaders Chase Elliott and Kyle Busch. Busch passed Elliott with two laps to go and dispensed with Newman in the final corner. Those two points kept Newman from the Round of 12, sent home along with Kurt Busch, Kasey Kahne, and Childress teammate Austin Dillon. Newman started the weekend strong, running second-fastest in Friday’s opening practice to Kyle Larson with a best lap of 191.442mph. He then made the final round of qualifying, securing 11th with a lap of 189.813mph. With Happy Hour washed out, Newman lined up inside Row 6 alongside the #10 Warriors In Pink Ford of Danica Patrick. Starting last on Sunday was the #83 Champion Machinery Toyota of Brett Moffitt. Moffitt, along with Erik Jones and BK Racing teammate Corey LaJoie, were the only drivers who failed to turn a lap in qualifying. In fact, both Moffitt and LaJoie didn’t turn a lap in practice, raising a rules issue as to whether either car would be allowed to start. In the end, NASCAR allowed both cars to take the green, citing that BK had presented both cars for inspection and had fired their engines in the garage. Moffitt held last at the start, followed by LaJoie on Lap 1, then on Lap 2 the spot fell to Jeffrey Earnhardt. Circle Sport with The Motorsports Group welcomed a new partner on the green #33 Hulu Chevrolet this week with “Dynamic: The Original Self-Loading Wheel Lift” on the lower edge of the rear quarter-panels. Earnhardt was the first driver to lose a lap, which came on the 16th circuit. He held the spot through the first round of pit stops under the Lap 35 competition caution, when Timmy Hill and Gray Gaulding traded the spot. Gaulding, back in Premium Motorsports’ #55 Low T Centers Toyota, held last on the restart. The event which threw Newman into the picture occurred on Lap 44. Coming off Turn 2, Newman crossed the nose of Clint Bowyer’s #14 Haas Automation Ford running to his outside, stuffing Bowyer into the wall. The contact sent Newman, just ahead of Bowyer at the time, hard into the outside wall with the nose of the car. Both cars careened down the track but managed to keep going. While Bowyer made it to pit road, Newman’s car caught fire under the hood, forcing him to abandon the car on the apron. Newman climbed out without injury and the car was quickly extinguished, but done for the day under the “Crash Clock.” He’d fallen to last under that same caution. Bowyer managed to finish 27th. Finishing 39th was Moffitt, also eliminated under the “Crash Clock” when he incurred a penalty while the crew was attempting repairs on pit road. Both Gray Gaulding, who came to pit road with a fire behind the right-front tire, and Cole Whitt, who went to the garage for a broken hub on the #72 TriStar Motorsports Chevrolet, stayed in the Bottom Five for much of the race, but both returned to the track. Whitt climbed to 34th while Gaulding ended up 36th. Between Gaulding and Moffitt were David Ragan and Danica Patrick, who collided after Ragan’s #38 TheHouse.com Ford spun in Turn 2 on Lap 266. *This was Richard Childress Racing’s first Cup Series last-place run at Charlotte since October 8, 1989, when Dale Earnhardt’s #3 GM Goodwrench Chevrolet broke the camshaft after 13 laps of the All Pro Auto Parts 500. That race was Earnhardt’s second of five career Cup last-place runs, his first since 1982, and his first for Childress. *This marked the first last-place finish for car #31 in a Cup Series race at Charlotte since October 11, 1992, when Bobby Hillin, Jr.’s #31 Bryant Chevrolet was disqualified from the Mello Yello 500. For more on that story, the last time a Cup Series driver was disqualified, read our feature from last year at this link. *This was also Newman’s first last-place finish at Charlotte since May 27, 2001. Making his third start at the time, Newman won the pole for the Coca-Cola 600, less than a week after he lost the engine while leading the Winston Open. Newman led the opening 10 laps, then crashed from the lead in Turn 4. So despite Ryan Newman's run with mishaps, the chap has still managed to have good runs in some of the tracks this is so inspiring.